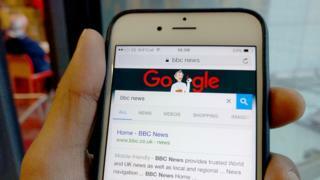 Google paid tech rival Apple $1bn in 2014 to keep its search function the default option on iOS devices, Bloomberg reports. A transcript of court proceedings from a copyright lawsuit against Google allegedly contains reference to a deal between the Silicon Valley firms. The alleged agreement involves Google paying Apple a percentage of revenue - as much as 34% - gained through iOS devices. The BBC has not been able to verify the claims independently. Bloomberg added that the referenced document has since been removed from the web. "The transcript vanished without a trace from electronic court records at about 15:00," the report noted. The court proceedings in question regard a lawsuit by Oracle Corp. in which the firm claims that Google used its Java software to develop Android but failed to pay for it. Analyst firms, such as Morgan Stanley, have quoted the $1bn figure in the past, but this appears to be the first time that a reference has been found in court documents. "It's a very lucrative business to be the browser of choice on a device or the search engine on a device," Chris Green, a technology analyst at consultancy firm Lewis, told the BBC. "It really does, I think, highlight the importance that's being put on being able to own real estate and the conduits through which people access information." However, Mr Green also noted that it was generally quite common for companies to pay hardware vendors fees for the placement of software and services on devices and that sometimes that may indeed be a percentage of revenue gained as a result. Other details about how Google manages its services emerged this week - including the fact that the firm removed 780 million "bad" advertisements from its sites last year. By bad, Google said it was referring to ads which linked to malware, promoted fake goods or covered up website content. In a blog post, the company said it had more than 1,000 people within its organisation responsible for weeding out these ads and that the number that had to be removed was increasing.